Sea Lion - Steller Sea Lions - Eumetopias Jubatus, British Columbia. The steller sea lion is a marine mammal, and a member of the Otariidae family characterized by its external ears. The steller sea lion is the largest of the earred seal family with males growing to a length of around 10 to 11 feet or 325 cm and the females reaching a length of approximately 7 to 9 feet or 250 cm. 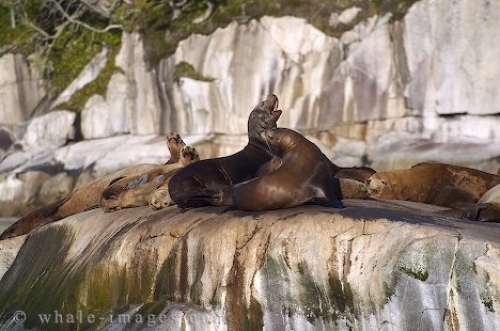 The Steller sea lion is a carnivore, feeding on a wide variety of fishes and cephalopods. Picture of some howling Sea Lions on the BC coast, Canada.